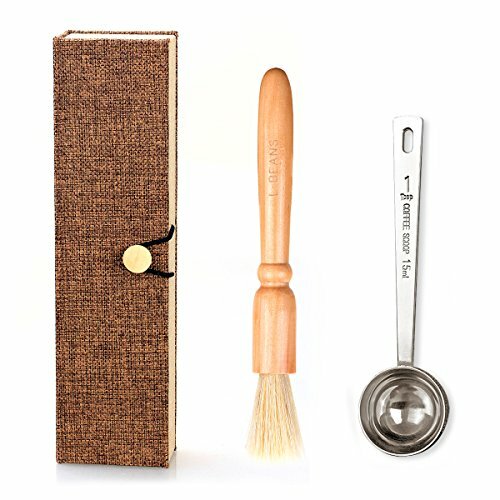 This grinder brush features a classic natural hardwood handle. This coffee grinder brush is specially designed to brush away coffee ground residue without damaging the blades. The bristles easily wipe away extra coffee grounds from the grinder and makes cleaning easier. Unlike the flimsy plastic coffee scoops that break easily or warp in the dishwasher, these scoops are made from stainless steel, and are sturdy, rust-resistant, and durable. They are just the right weight, heavy enough to not bend but lightweight enough for easy use. They are very easy to clean. Just rinse them off after using and you're good to go. They can also be washed in dishwasher. Their compact size makes them easy to store in kitchen drawers. Spoon has small hole on one end, so they can also be hung on the kitchen hooks. The short bristles make quick work of cleaning canisters and grinders. The scoop is just the right measurement for either coffee beans or ground coffee. This is a very-well made, high-quality brush. It does a great job of keeping coffee grinder neat and clean.Easy to use and easy to find. The coffee scoop is made of 304 steel and looks very nice, well made, and durable. Nice long handles; easy to use and clean. 1 Tablespoon (15 ml). The bristles are pleasantly stiff, unlike some other brushes. That allows it to do a very good job at brushing out fine grinds from oily beans. The cleaning process removes stale grounds and prevents crossing grounds from different beans in the same brew. Get precise measurements and keep your grinder in clean, perfect working order. Being multi-purpose, they can be used to measure and cleaning things other than coffee, like tea powder, sugar, baking powder, baking soda, etc. If you have any questions about this product by Remtise, contact us by completing and submitting the form below. If you are looking for a specif part number, please include it with your message.